Sam Rany: Can U.S. Universities Stay on Top? At the Indian Institute of Technology in Delhi—one of the best engineering academies in the country—we met Shriram, a 21-year-old man who ranked 19 out of 485,000 on the school's very demanding entrance exam. We call him Mr. Number 19. Shriram can tell you the date and time when he found out his test results. The exam—and the preparation for it—dominated his teenage years. He was singled out as a "big talent" at an early age, with an aptitude for mathematics and science. To get ready for the IIT entrance exam, he enrolled at a private coaching institute that prepares students with aggressive drilling in the major testing areas—physics, chemistry and math. Over those two years, Shriram estimates that he studied 90 hours every week. When Shriram arrived at the IIT, he found a class filled with academic superstars. The faculty has high expectations. On the first math exam, his freshman class received an average grade of 30%. Shriram did poorly too but soon bounced back, sacrificing sleep so that he could study. "All my life I wanted to be here," he says. "I knew that if I could go to IIT, major in engineering, work and study hard, my life would be perfect. I would marry a beautiful girl, start a company, help my country advance and deliver on my family's hopes and dreams." Both India and China have intense national testing programs to find the brightest students for their elite universities. The competition, the preparation and the national anxiety about the outcomes make the SAT testing programs in the U.S. seem like the minor leagues. The stakes are higher in China and India. The "chosen ones"—those who rank in the top 1%—get their choice of university, putting them on a path to fast-track careers, higher incomes and all the benefits of an upper-middle-class life. The system doesn't work so well for the other 99%. 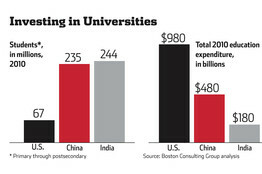 There are nearly 40 million university students in China and India. Most attend institutions that churn out students at low cost. Students complain that their education is "factory style" and "uninspired." Employers complain that many graduates need remedial training before they are fully employable. For now, the U.S. university system is still far ahead. But over the next decade, there will be a global competition to educate the next generation, and China and India have the potential to change the balance of power. With large pools of qualified students coming of age, the two countries have made reforming their universities a top priority. How far do they have to go? At the Boston Consulting Group, we have developed a new ranking to determine the educational competitiveness of countries: the BCG E4 Index. It is based on four Es: Expenditure (the level of investment in education by government and private households); enrollment (the number of students in the educational system); engineers (the number of qualified engineers entering the workforce), and elite institutions (the number of top global higher-education institutions). The U.S. and the U.K. are ranked first and second, driven by raw spending, their dominance in globally ranked universities and engineering graduation rates. China ranks third and India fifth, largely on enrollment (Germany is fourth). The reasons for U.S. supremacy are clear: For one, it spends the most money on education, disbursing $980 billion annually, or twice as much as China and five times as much as India. It is also the most engineer-intensive country, with 981 engineering degrees per million citizens, compared with 553 for China and 197 for India. American universities currently do a better job overall at preparing students for the workforce. The World Economic Forum estimates that 81% of U.S. engineering graduates are immediately "employable," while only 25% of Indian graduates and 10% of Chinese graduates are equally well prepared. "Chinese students can swarm a problem," a dean at a major Chinese university told us. "But when it comes to original thought and invention, we stumble. We are trying hard to make that up. We are trying to make technical education the grounding from which we solve problems." In China, Peking University, founded in 1898, is generally ranked as the country's top school. One student there told us in a very serious tone: "Good luck finding a place in the library. You can't find a seat even at three in the morning." Peking University is now part of an effort launched in 2009 to create a Chinese counterpart to the Ivies—called the C9 League. The objective is to attract the best graduates and faculty with an array of super-funded institutions. The schools recently received $270 million each in government funding, and they are also drawing back "sea turtles"—Chinese Ph.D.s from abroad—to lead the renaissance, with relocation bonuses as high as $150,000. Though the C9 schools have the greatest potential to break into the global elite, Chinese officials also identified 100 key universities at the next level, where they have invested a total of $2.8 billion. The difference in student quality between these tiers is often insignificant. The Gaokao is China's national educational test, given to 10 million secondary students to determine their rank and placement at university. The top scorers become national celebrities. But critics say that the test's emphasis on memorization, fact recall and processing speed can determine college admissions too arbitrarily. "I did not feel well the day of the test," one recent graduate told us. "As a result I placed in the top 10%, not good enough to get into the C9. I felt like my life was over." Compared with China, India has farther to go. A senior dean at IIT Delhi said that he deals daily with shortages of equipment, poor pay for teachers and quotas that sometimes put students who can't read or speak English in the classroom. (The quotas are meant as a remedy for the caste system.) "We are underfunded, we have too few Ph.D.s on faculty, and we have a fifth of our enrollment taken by quota with no remedial programs," he lamented in his hot, open office. One of the reasons for the underfunding is the relative weakness of India's central government, which accounts for only 15% of total expenditure on education. The 28 states that account for the balance vary greatly by wealth and infrastructure. But unlike China, India has significant private education, with nearly 200,000 private schools and 17,000 private colleges. The World Bank and private investors are pouring billions of dollars into education there, and the government plans to expand its best-known universities, as well as community colleges. The current five-year plan proposes higher-education investments of more than $18 billion. Even with the current push, the combined higher-education resources of India and China will just begin to match the $32 billion endowment of Harvard alone. But success in these countries is based as much on attitude as on funds. The IIT's Mr. Number 19 represents a generation of driven, talented students who are intent on improving their lives. In one student's room at Peking University, the commitment to advancement is summed up with a phrase on a poster board: "If you work hard enough, you can grind an iron rod into a needle." —Mr. Silverstein is a senior partner at the Boston Consulting Group. Mr. Singhi is a partner and director of its India consumer practice. Adapted from "The $10 Trillion Prize: Captivating the Newly Affluent in China and India," co-written with Carol Liao and David Michael, to be published on Oct. 2 by Harvard Business Review Press. Which countries have the most competitive educational systems world-wide? The Boston Consulting Group's new E4 index assigns points in four categories, each equally weighted in the final score. Of the 20 countries ranked, here are the top 10. A version of this article appeared September 29, 2012, on page C3 in the U.S. edition of The Wall Street Journal, with the headline: Can U.S. Universities Stay on Top?.